COMPANY PROFILE Newmont Mining Corp is engaged in the production of gold in the United States, Australia, Peru, Ghana and Suriname. It is also engaged in the production of copper, principally through Boddington in Australia and Phoenix in the United States. Newmont Mining is one of the world’s largest gold producers. In 2017, the firm produced nearly 5.3 million attributable ounces of gold and 50 million attributable pounds of copper. North America accounted for 42% of attributable gold production, South America 13%, Australia 30%, and Africa 16%. As of Dec. 31, 2017, Newmont had 68.5 million attributable ounces of proven and probable gold reserves. 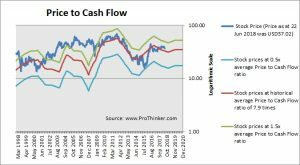 At the price of USD37.02 as at 22 Jun 2018, Newmont Mining Corp is trading at a Price to Cash Flow Ratio of 8.9 times last 12 months cash flow. 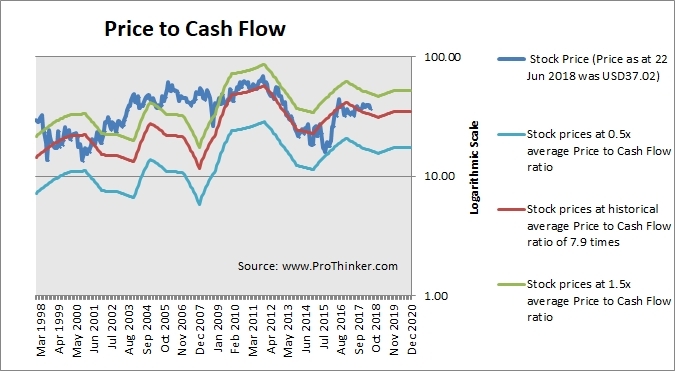 This is a 13.0% premium to its historical average Price to Cash Flow Ratio of 8.8 times.